Add 6 liters of water and the rinsed beans to a large casserole or Dutch oven. Bring to a simmer over medium heat and cook at a steady rolling simmer, with the lid slightly ajar, for 45 minutes. Incorporate the pork chunks, halved white onion, epazote or cilantro sprigs, and salt and stir. Continue simmering for another hour and a half, partially covered, until the pork is completely cooked and tender, making sure the broth does not dry out – I add another 4 cups of boiling water after I add the pork. Turn off the heat. Taste for salt and add more if need be. Serve with garnishes of julienned radishes, chopped cilantro, diced avocado, lime quarters, Chiltomate, and habaneros (they can just be cut and dipped into individual bowls to add a bit of heat, called "chuk" or "remojar"). Each person can “puuch” or mash and mix the garnishes of their choice in their bowl. It is customary to serve along with warm corn tortillas. Pati, I love your show and all your recipes. I have been a fan a long time! I will make this recipe, just watch your show on this lol thanks for sharing. Do you have an Instagram address? I only added 4 liters of water at the start. My dutch oven is not that big! Hope that is OK. I can add more once it reduces. Sure…and next time you may want to also adjust the amount of beans to keep the beans to water ratio. Hope you love the recipe, Craig! Pati, love watching your show every Saturday. In this recipe instead of the 4 fresh epazote sprigs or 15 cilantro sprigs, tied with kitchen twine, would it be possible to use Chaya? I have a large hedge in my yard and would love to be able to figure out how to use it. Go for it, JoAnn! It will be yum too. I made this soup for dinner yesterday and it was a total hit. My 9 year old had seconds, and my 5 year old (the picky eater) ate his whole bowl without complaining or trying to leave the table! It was delicious and will definitely be added to our recipe rotation. Just looked at this episode. Love your show and your personality. Always feel like a friend is in my living room. It’s my favorite cooking show and I watch many. Your food always looks tasty beautiful. I’ll definitely be making this pork and beans. I do have a question. What are a few spices, rubs, chilies should one always have on hand? That’s a great question Nalini! I recommend the following spices: Oregano, Cumin, All Spice, Thyme, Marjoram, Bay Leaves, Epazote, and dried chiles like Ancho, Guajillo and Chile de Arbol. Not sure where to find epazote as I live in South Dakota but the other stuff is definitely doable. Thank you. If there is a latin-american shop they may have dried epazote. Made this yesterday and it was delicious!!! Had to improvise a bit with the spices and added some fresh ground cumin! Shared with all my very cooking-oriented family. Gracias! Yay! I hope that whole family loves it! I am going to make the beans today. Just wanted to clarify that I add 4 more cups of boiling water right after I add the pork, then let it cool for 1.5 hours? Oh how lovely…thank you for sharing Nicole! I add the 4 extra cups to make sure the broth does not dry out after I’ve added the pork. I’ve made this recipe several times with the pork and love it! I have some chicken breast to use up this week and wonder how you would incorporate that instead of the pork, if at all. I’ve never tried…but yes do try chicken and let me know how it goes. Depending on the size of the chicken, you may have to adjust cooking times to make sure that the chicken is cooked all the way through. Do you brown the meat before you put it in the water? I put the pork right in, but you can brown it if you like. can I use kidney beans and can i put this over white rice if i add more stock? love your shows. Yes you can use kidney beans and put it over white rice. Enjoy! Just got back from the Mexican Grocer with some Epazote!!! Im gonna make the Chiltomate tonight and make this dish for tomorrow! My favorite cooking show, Pati, i love it, especially your trips to mexico!!! Have a great Cinco!!! Thank you Rocky! Happy Cinco to you too! Frijol con puerco es con la carne sal fresca. You must salt the meat first. That change the taste​. That’s the way we do it in Yucatan. Thank you for correcting me! You should salt the pork first. Hola pati me gusta mucho tu programa y hoy hice los frijoles negros con carne de puerco y salio delicioso. 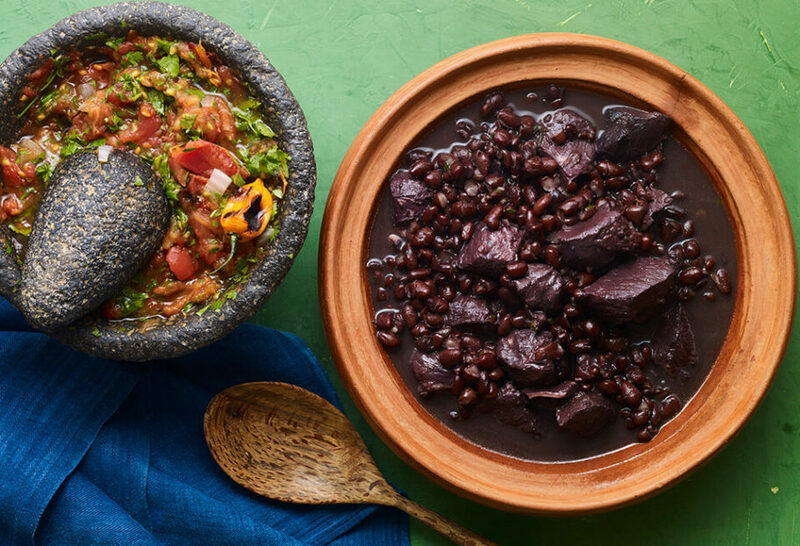 Soy mexicana y me encantan los frijoles negros me remontan a mi infancia asi que los disfruto mucho. I am kosher and cant have pork, can I use beef? What beef cut would you recommend? Yes of course! You can switch for brisket. Hi Pati, I caught your show on our local PBS station here in Florida. I didnt catch the first part though and I have one question. Did you use dry beans? I used dry beans Trini. Its cooking now we shall see. 1 and half hours to go Mines going over rice. I fell in love black beans in Spain while in the military. Thanks for bringing me back viva La Mexico. You rock. Glad I live in Texas! Epazote is readily available at the local mercado, along with anything else I need to make your wonderful dishes!! Viva Pati! These look great. I love black beans! Thank you for a wonderful recipe. Hope you like them Jan! Being in the mood for a really great bean dish, I decided to give it a try after watching you on a local public tv station just this weekend. My oh my! Followed to a “t” using country style boneless pork (small amt of fat) & the cilantro (as the other herb would’ve started making it too much like a job! ) Such an honest and authentic treat! Have already shared and will use for many meals to come. I appreciate how you treat your recipe adaptations for your followers. Thank you! Thank you for trying and sharing the recipe Glenda! Super happy you enjoyed it. I have enjoyed your show since you started. I made your pork and beans today and they came out great! However, being from Texas I have to admit I like pinto beans more than black beans so I substituted them. And, since I live in Alaska, there was no epazote so I used cilantro instead. I just wanted to thank you for the show and to let you know the pintos work just as well in your recipe. I enjoy watching your show on PBS, and I love the recipes you share. I saw the episode with this recipe a couple of months ago and have been wanting to try and make this. I recently had someone give me 4 bags of dried black beans, and my local grocery store had pork on sale this week. With our cold Indiana weather, I figured tonight would be a perfect night to try out this recipe. I don’t have any cilantro on hand so I will be leaving that out. Excited to try it. Thanks for sharing! Lindsay I hope the beans help keep you warm in Indiana! Hi Pati! I want to start off by saying that my partner and I met you in LA for your book signing and your as sweet and charming and it was a pleasure to meet you in person. Now on to this dish. So easy and delicious. I made this last night and wow I was really impressed at how good it came out. I will be making this dish again. Thanks! So, So yummy. It was a big hit from my kids to grandparents! Keep your wonderful recipes coming!! Should the beans soak overnight first? I assume you mean dried beans. Try MegaMart or HMart! Also, a specialty foods store may also have it.